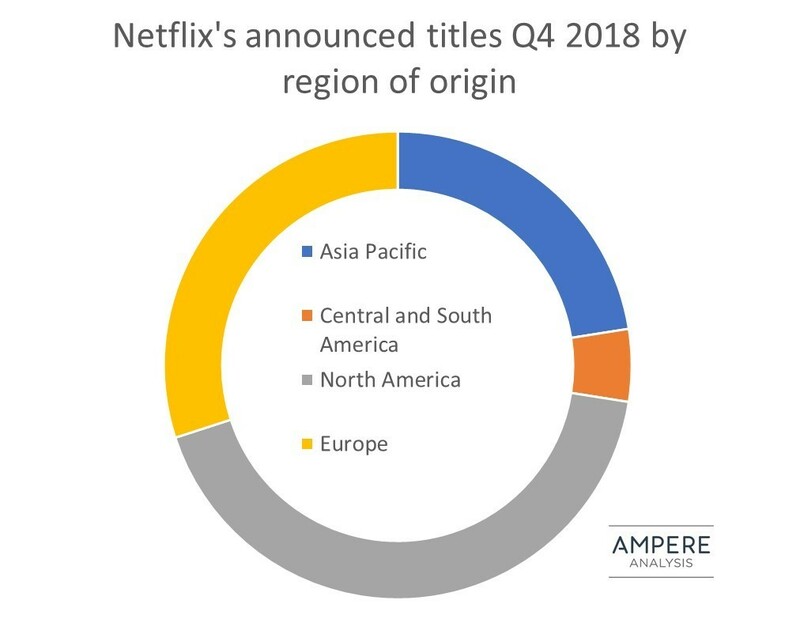 Netflix is aggressively ramping up global productions, particularly in Europe and Asia according to Ampere Analysis. Netflix has seen impressive growth in these markets, adding eight and nine million subscribers respectively between 2017 and 2018. Hoping to replicate the success of hits like Dark from Germany and Sacred Games from India, Netflix announced 24 new titles for Europe in Q4 2018 – that’s equivalent to the total for the region in 2017 and represents 22% of the upcoming catalogue. Netflix’s investment in localised foreign language content not only maintains subscriber growth, it helps fight domestic competition by captivating users with high-quality international productions. The success of series such as Elite, Narcos and Sacred Games with both native and English language audiences illustrate how international productions can deliver a double whammy for the service. 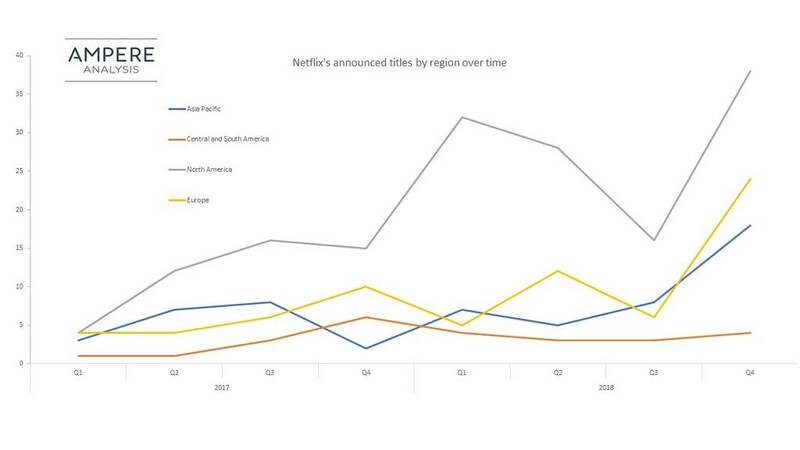 36% of Netflix’s upcoming originals will be non-English, and 46% will originate from outside the US and Canada. Netflix is currently producing new content in 25 countries, with 133 titles originating outside of North America, including its first African title. It is heavily focused on specific markets, with the top two international producers of the UK and India accounting for 32% of international productions, and the top five accounting for 56%. Additionally, it is rapidly increasing production in key markets across Asia and Europe, particularly those that have created hit shows for the streaming service in the past. The UK has added 10 titles so far in Q4 2018, India eight, Germany six, and five each in Japan and Spain. Fred Black, Analyst at Ampere Analysis says: “Locally produced, local language content is key to Netflix’s current and continued success, and these figures underline how important that strategy will remain in 2019. But there are other issues too. Netflix is pushing hard to comply with incoming European Commission quotas that would set a minimum of 30% of streaming content to be European in origin, and European titles make up 29% of Netflix’s announcements this quarter.